This week’s photo challenge is unusual. When I was in Africa, I saw many animals and behaviors that struck me as odd. When I think of giraffes eating, I picture them nibbling on leaves from the tops of trees. However, they crave nutrients that can only be found by licking the soil. Watching a giraffe lean over to lick the soil is humorous. 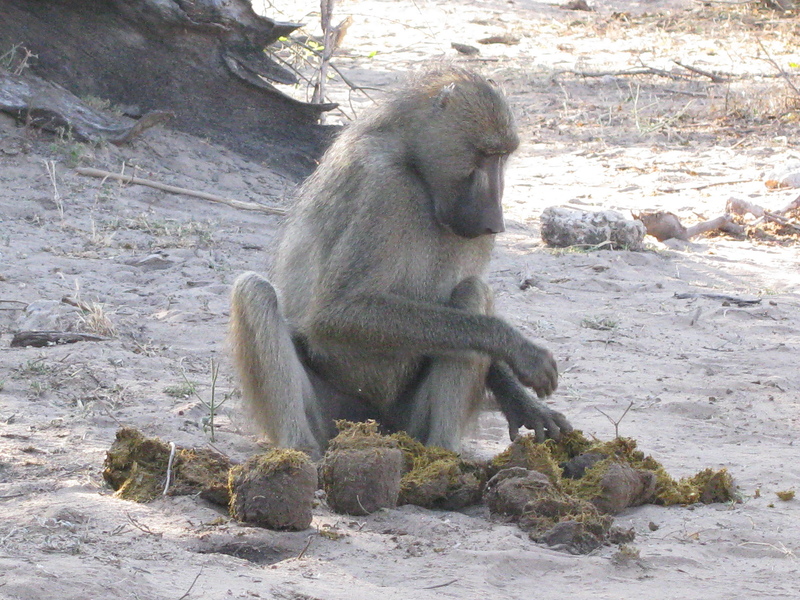 Here is a baboon sifting through poop looking for seeds. The seeds grow on trees and the baboon can’t reach them. Larger animals eat the seeds but don’t digest them. This entry was posted in Random and tagged Africa, Baboons, Botswana, Giraffes, Photography, Weekly Photo Challenge. Bookmark the permalink. Happy as a monkey in poop! Your photos are perfect for the challenge. But my laughter isn’t unusual because everyone viewing your post will get a chuckle out of it. Thanks so much for brighting my day with a smile. Love the giraffe! Great shots! Ok, the baboon picking through the poop almost made me spit my cereal all over my iPad. That is hilarious!! I can’t wait to gross my kids out with that one this morning :). I just literally lol’ed at your giraffe pic – so funny and a great shot. I love the giraffe picture. I want to explore the world like you! I had no idea that giraffes had to lick the ground for nutrients. 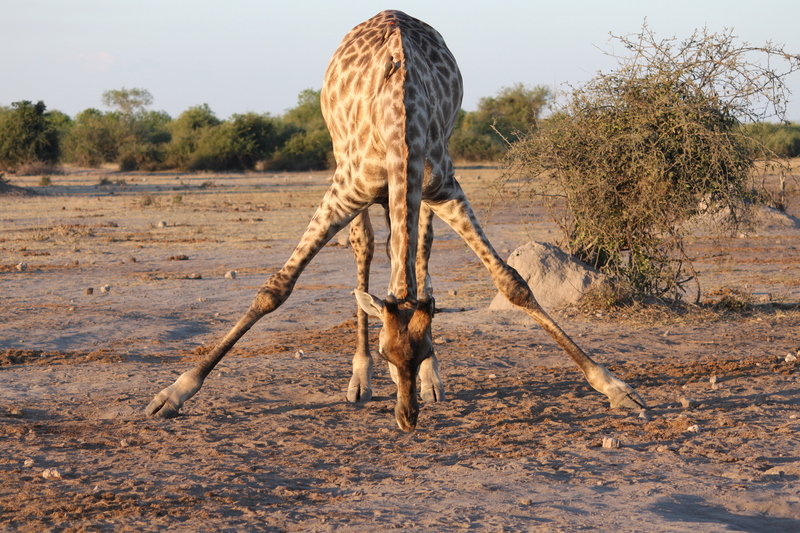 How neat – the giraffe looks like he’s doing yoga stretches. The giraffe caught my attention. Hilarious! I never realized giraffes do that. Very amusing. The monkey and the poop… yuck. Perfect, and great photos! The giraffe looks so awkward and clumsy, but probably is perfectly natural for them. The baboon…oh dear…but I have seen dogs go through other creature’s waste as well. I love these photos. The baboon one is funny! The picture of the giraffe is great. I give it credit for looking classy while bending over. Brilliant – that giraffe looks like it is doing yoga! lol LOVE the giraffe, nice shot! Food in abundance – in the most unusual of places indeed.